Agnes Lewis – A Skilled Closeout Specialist! 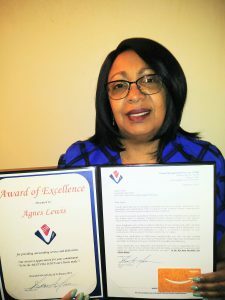 | Veterans Management Services, Inc.
Agnes Lewis – A Skilled Closeout Specialist! Agnes Lewis with her award. VMSI recently presented Agnes with an Award of Excellence based on feedback from the VA regarding her support to the Supply Team within the Veterans Integrated Service Network (VISN) 10. The client feedback we’ve received for your exceptional contract closeout efforts is a direct reflection of your strong work ethic and the way you’ve established yourself as an important member of the VMSI team! We sincerely appreciate your can-do attitude and willingness to help wherever you can, this is a powerful indicator of your commitment to the success of the team and to the VA’s goals!